Haydn’s extensive and influential output of orchestral music culminated in his symphonies nos. 93–104, known as the “London Symphonies,” composed for London impresario Johann Peter Salomon. Originally from Germany, Salomon was a violinist, impresario, and composer who played a leading role in the musical life of England from 1781 until his death in 1815. 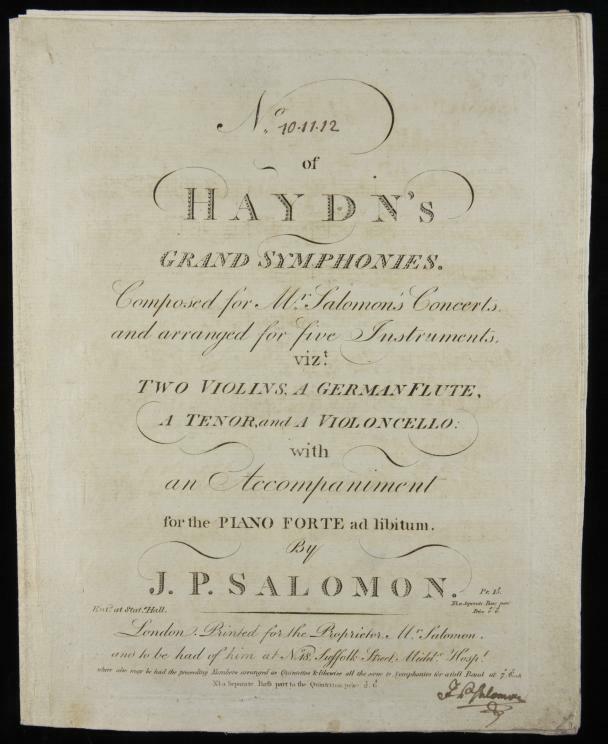 Salomon’s greatest success was in bringing Haydn to London in 1791–1792 and 1794–1795. Already famous throughout Europe, Haydn further enhanced his international reputation in London, where he composed and published new music, taught, appeared in public concerts, and performed privately for the royal family. 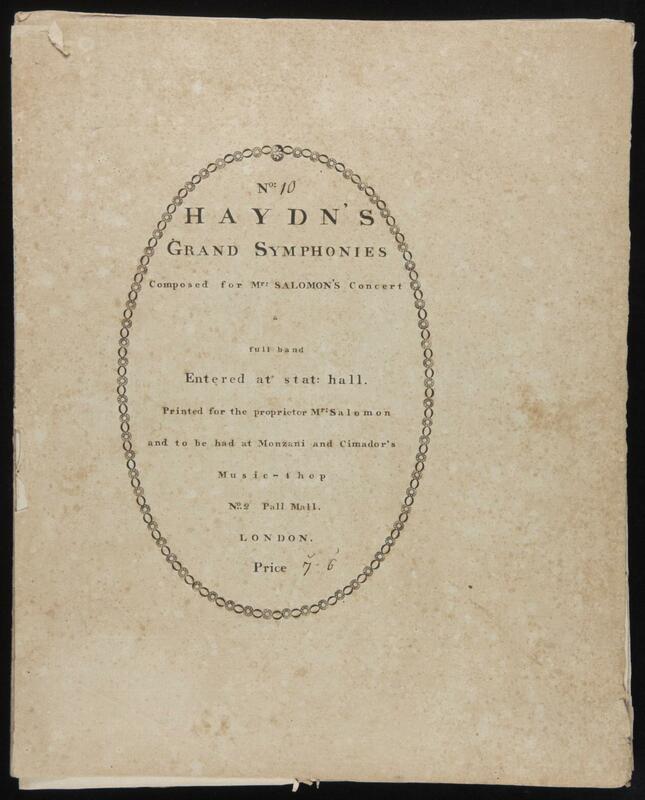 The Archive contains sets of printed parts, in first or early editions, for several of the London Symphonies. Symphony no. 99 was composed in 1793 and performed in London on February 10, 1794. The cover of the first violin part for this early edition is annotated in manuscript with a numbering designation used by the printer. By “full band” the printer indicated a complete set of parts for Haydn’s original instrumentation: 2 flutes, 2 oboes, 2 clarinets, 2 bassoons, 2 horns, 2 trumpets, timpani, and strings. The London Symphonies were a brilliant success with musicians and audiences. This version for six instruments, accessible to a small group of chamber musicians or amateurs, was arranged and published by Johann Peter Salomon, whose signature appears at the bottom of the title page.